City takes needed steps to implement plan for two-mile esplanade along the East River from Battery Park to the Williamsburg Bridge. Image: NYC EDC. Plan covers East River waterfront from the Battery to the Lower East Side. The Planning Commission approved two linked applications that will implement an East River Waterfront Concept Plan that was developed in 2005 though a planning effort that included 70 public meetings and intensive input from the community. The plan calls for revitalization of two miles of the East River waterfront, stretching from the Battery Maritime Building to Pier 42, located just south of the Williamsburg Bridge. This first phase will be funded in part by the Lower Manhattan Development Corporation, which has set aside $150 million as part of its efforts to redevelop lower Manhattan. The two applications approved by the Planning Commission on July 25, 2007 will facilitate the construction of five commercial pavilions and improvements to four piers. The applications allow the sale of City-owned property under the FDR Drive and on Piers 15 and 35 to the New York City Economic Development Corporation, and site selection for property located on Piers 35, 36, and 42 and under the FDR Drive. 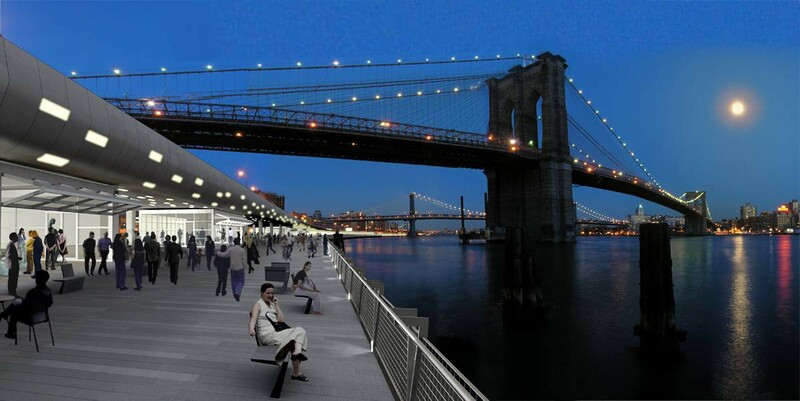 The pavilions, to be built under the FDR Drive, include 27,000 sq.ft. of space for cultural, recreational, and retail uses. EDC will select the specific operators for the pavilions through a request for proposals after the transfer. On the sites selected on Piers 35, 36, and 42, the plan calls for new open space, including kayak and small boat docking, picnicking areas, and possibly a beach complete with sand and a floating pool. The plan also calls for open space under the FDR Drive, including indoor recreation facilities, bicycle rental/storage space, cafes and restaurants, performance space for dance or martial arts, and gallery and exhibition space. On a portion of Pier 15, the proposal includes an educational facility focused on maritime or environmental issues. At the Commission’s vote, Chair Amanda Burden emphasized that the pavilions will bring important “revenue producing aspects” to the East River waterfront. Commissioner Karen Phillips praised the plan, calling Chair Burden’s role in its development and implementation pivotal. The City Council voted on August 6, 2007 to request to review the proposal, and its Subcommittee on Planning, Dispositions & Concessions plans to hold a hearing later in August.